In 2015 the Board of Trustees approved the launch of a new model for Episcopal Education with the support of the Diocese of Central Florida. Blended learning means that students have access to world class curriculum, resources and technologies to enhance their physical classroom instruction. The online curriculum allows students to work directly with their classroom teacher or accelerate at their own pace. • Flexible scheduling enables students to persue college credit while meeting High School requirements. 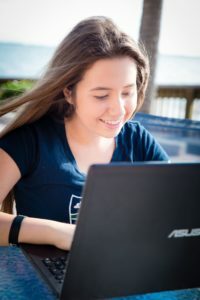 • By infusing optional online classes, students can expand their curriculum choices to accelerate, travel or pursue internships, jobs, or high level athletic preperation while in school. • Parents can access and track your child’s progress anytime, anywhere using our parent portal.